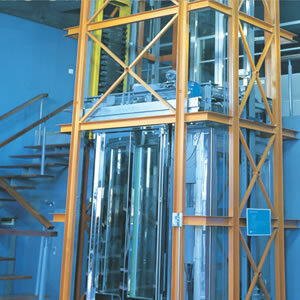 A machine roomless elevator is also referred to as MRL elevator. As its name suggests, it is an elevator that doesn't require a machine room. Therefore, this elevator system greatly saves space. Adopting permanent magnet synchronous drive technology, it is more energy efficient, eco-friendly, with high motion precision. We are a professional machine roomless elevator manufacturer and supplier in China. Our V8-M machine roomless elevator is based on the most advanced traction technology, integrating high technical performance of V8. This elevator can simplify building design, efficiently use space and save constructing cost. Suzhou DHT standard car is simple in design and fashionable in style, being able to well fitting your buildings' styles. 1. Car wall is reasonably patched with stainless steel and spray-powder steel. 2. Ceiling can be chosen from standard styles. 3. The platform is high-quality plastic floor, or reserve space for stone decoration according to host's favor. To provide convenient and prompt maintenance service for customers, Suzhou DHT Elevator established a 24-hour service center and set up a toll free 800 require hotline. Our skilled maintenance technicians will answer your questions and assist you in troubleshooting immediately. The remote monitoring system using advanced data network and microcomputer processing technology can perform 24-hour remote electronic monitoring on elevator, thereby helping predict the potential hazards and fulfill preventative maintenance service. This greatly improves the operation quality and safety of the elevator. Besides MRL elevator, DHT Elevator Co., Ltd. also produces panoramic elevator, home elevator, and freight elevator etc. To satisfy your specific requirements, custom elevator is also available. Please feel free to contact us if you have a need for our elevators. Thank you!